After all the hard work and sleepless nights, LaLune Production’s effort to finish their thesis and be recognized by a prestigious award giving body were realized on October 12, 2016. 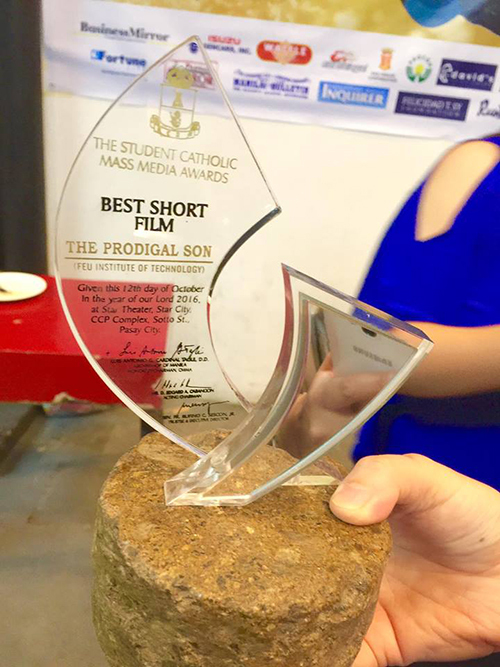 Their thesis, an 8-12 minute animation about the parable of The Prodigal Son, won the Best Student Short Film at the 38th Catholic Mass Media Awards Wednesday night. Congratulations #LaLune! This entry was posted in Arts, Events, Inspirational, Occasion, Personal and tagged Catholic Mass Media Awards, CMMA award, CMMA trophy, The Prodigal Son - CMMA Best Student Short Film 2016 on October 16, 2016 by Yami.